Not an RA fangurl was stirring, not even Melissa the Mouse. 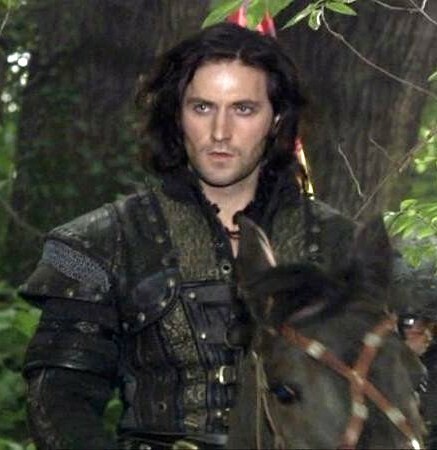 In hopes that Sir Gisborne soon would be there. While frissions for sugar peaches danced in their heads. The vidders, bloggers, designers, and authors settled our brains for a long winter’s nap. Lucas sprang from his floor bed to see what was the matter. Not Gordon, but Captain America, made him dash. 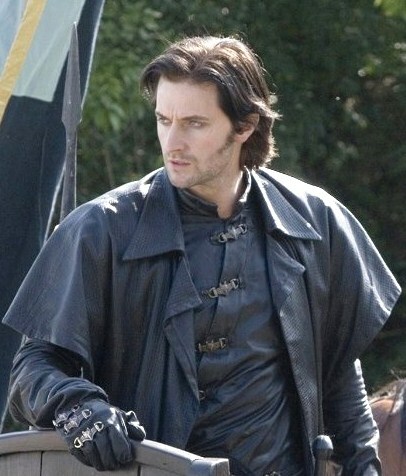 Gave lusty dreamings at all hours to Gisborne fans of the Robin Hood show. 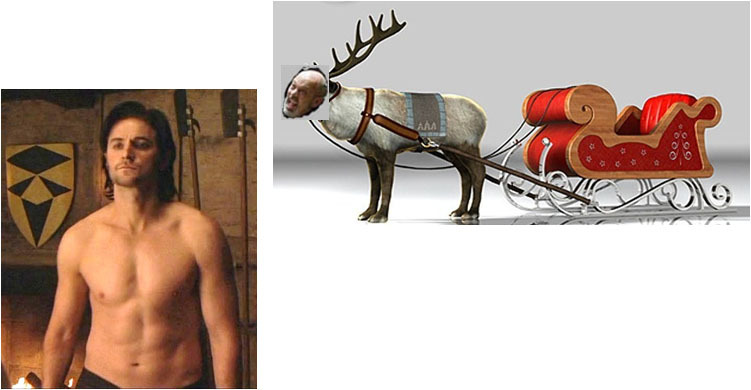 But a miniature Vasy pulling a sleigh, harnessed up like a reindeer. “Now Archer! Now Tuck! Now Guy the Panther, and that Marian Vixen! On John! On Allen! On Kate! On Much, with dinner a fixin’! To the top of Nottingham’s battlements! To the top of the wall! 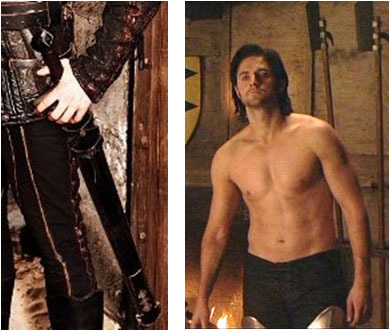 When Robin and Guy the Panther meet in battle, the hair count goes to Sir Guy. With bags full of swag for the villagers, too. The prancing and pawing of each little Vasy hoof. Down came the musicians trumpeting their brass sound. Sir Guy’s eyes how they twinkle, his smirk how merry! His cheeks are chiseled like marble, his nose Romanesque, oh very! And the beard of his chin has just the right amount of stubble, don’t you know. Shows the wear and tear of being used by him knightly. That ladies bounce coins off of I tell you, no really. After all, in years to come he would portray a Dwarf, not an Elf. Soon told the wenches they had nothing to dread. And filled Nottingham’s coffers, not letting the villagers shirk. And turning his leather clad bod, Sir Guy struck quite a pose. And away they all rode as they hunted down Vasy the weasel. “On second thought, ladies.” Remarks Sir Guy. P.S. Check back at this blog on Thursday for a special video parody I also created to complement Bccmee’s blog (http://fanvideos.wordpress.com/) that day, because Thursday, December 1, 2011 Bccmee will launch her “12 Days of Guyness” mediated images events. Bccmee is a genius when it comes to media technical creativity. I’m just a novice. But, it’s been fun planning my Guyness blog post parodies to complement her blog’s Guyness events. And I appreciate her encouragement of me. Thanks! (1) My grateful thanks to the wonderful resources at www. 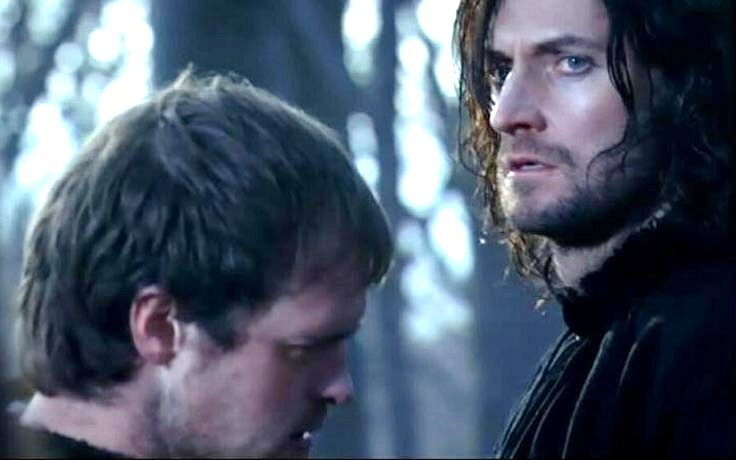 RichardArmitageNet.com for the Sir Guy of Gisborne (as portrayed by Richard Armitage), Sheriff Vasy (as portrayed by Keith Allen), and Robin Hood (as portrayed by Jonas Armstrong), and many other screen caps from the BBC’s Robin Hood. (5) And special thanks to my RA friend Dhana for proofreading an early draft of my poem parody and catching some of my typos–or the MSWord “guessing” typos. This entry was posted in Authors, Creative Writing, Fangurling, Love and Relationships, poem, Richard Armitage, Romance and tagged parody, poem, Richard Armitage, Sir Guy. Bookmark the permalink. Thanks for your wonderfully kind note! I was giggling as I wrote the poem. And I want to also acknowledge my RA friend Dhana for proofreading an initial draft for me and catching some of my typos. Of course you–and myself and others– are part of the “etc.” We’ll have to set up an Armitage World dormitory to house all of us. Ha! P.S. If you are the 10,000th view to this blog, please leave a comment so that I may acknowledge you. No prizes. Just bragging rights. Cheers! Congrats on hitting nearly Ten thousand hits! Awesome! My little blog has now topped 10, 238 views in three months. Who would have ever thought it? I’m tickled pink! And congratulations for the 10’000 view for you blog. I’m glad that you liked my poem parody. And thanks for your congratulations! I’m from Brazil, my English is lame, but people here in Armitage World seem not to care about it, they’re very friendly and kind. Enjoy! And it helps me to improve my English, LOL. Your English is not lame. It’s much better than my Portuguese. Ha! I have an RA friend named Dorita in San Paolo who very kindly helped me write a thank you note in Portuguese to a Brazilian colleague one time. Besides, we’re all family here in Global Team Armitage. Thanks for your kind note. And your English is just fine. It’s so neat to have people around the world visiting my little blog. Thanks to the site http://www.wordreference.com that helps me a lot for the translation of some words, LOL. I love that you’re from Switzerland! I’ll picture snowy mountains when I think of you. No snow here yet. Danke für Ihren Besuch und kommentieren. C’est tellement agréable de rencontrer quelqu’un de la Suisse. Congrats for the 10,000th view of your blog, I’m sure it will be more and more read and appreciated in the course of time. You deserve it. Enjoy your dinner with hubby! How nice of him to take you out. Thanks for your very kind remarks about my poem parody. My “funny bone” is the biggest bone in my body. Ha! Thanks also for your kind congratulations for my blog milestone. I’m tickled pink that people seem to enjoy my little essays. And yes, Richard Armitage as my muse keeps my writing and blogging happily–as do faithful readers and commenters such as yourself. Your word slinging sheds a whole new light on Sir Guy. Love it!!! Wow, you covered a lot of ground. Super funny stuff. Love the dwarf reference, LOL! Thanks for your kind note. I had fun writing the poem parody. Thanks also for the convenient pingback today so we can link to your last Portember gif/graphic today. Gosh! That was a fun and creative activity on your part. 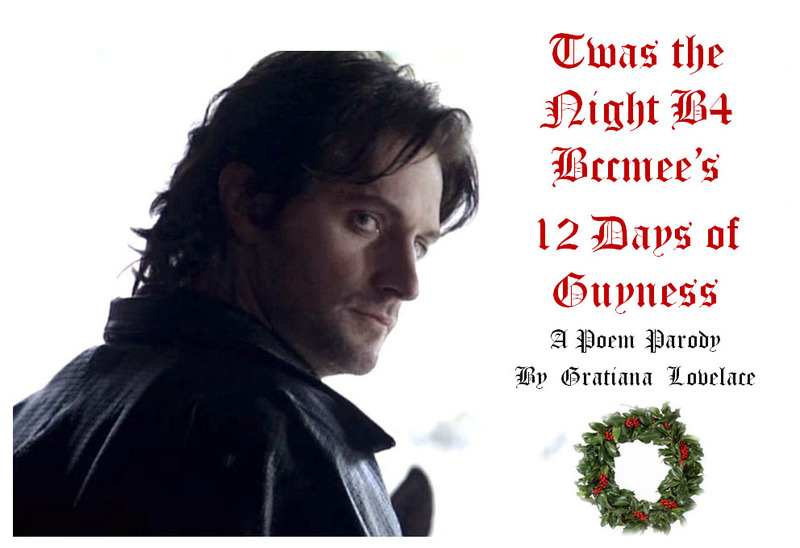 I look forward to the “12 Days of Guyness” starting tomorrow on your blog “bccmee’s Richard Armitage Vids & Graphics” (http://fanvideos.wordpress.com/). 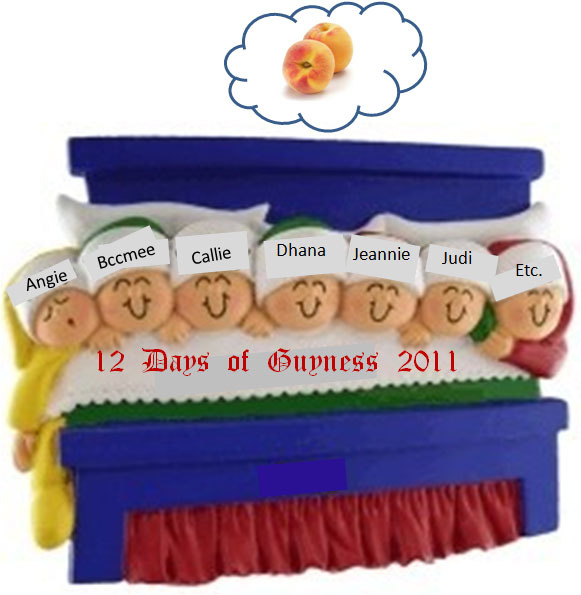 the 12 Days of Guyness had me in stitches. You rhymed it so well, without any glitches. Thanks for your kind note–and rhyming it! Giggles! I’m glad that you and others enjoyed my little poem parody. Thanks for your kind note! Another great reply in verse. Giggles! December is going to be delightful! Many thanks for the phrase in Portuguese, I’m flattered. I often use a translator tool, so in my opinion you’re not cheating at all, LOL! Will you intend to post another surprise of yours tomorrow? You’re most welcome for my message in Portuguese. I love having friends around the world! Yes, tonight–or 12:05am Dec. 1st (Central Standard Time)–I’ll post a song parody video that I also created as a companion to Bccmee’s 12 Days of Guyness. So, more fun tomorrow. Then on Friday, I’ll post another Chapter of “Guy’s Rose”. So this week is just “guy-li-cious” all the way around. Ha! As for your poem, brilliant. Absolutely hysterical. And the RAnet illustrations – isn’t it fun? It’s so marvellous to have so many from all parts of the globe in this community. Fabi, nothing lacking about your English. I’m poor at languages. So April, my German sufficed for basic shopping and asking directions; my Italian was based on a few years of Latin (which did not fly in Italy or Switzerland, and even my French is out of practice. Gratiana, kindly do not settle in for a long winter’s nap from the blog. Thank you. Thanks for your very nice note! I’m quite bowled over by the response my poem parody received. I’m glad everyone enjoyed it so much. I tend to be more of a humorous girl, anyway. Ha! 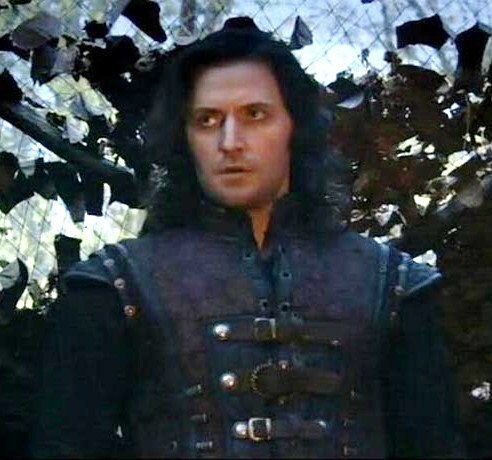 And I’m thrilled that Armitage fans are around the globe! It’s fun meeting and chatting with everyone. As to my “napping”? Not a chance. Ha! I’ve got about 10 posts in line now–not counting my story posts. And, my RA gal pals are an endless source of inspiration–as is Mr. Armitage, himself–as we chat. I’m going to dash now to upload the revised version of tonight’s Dec. 1st song parody video and then post it here around 12:05am. You are doing a great job in conveying your meaning in English–despite your protestations. So kudos to you, and take a bow. Thanks for visiting and commenting. Happy Holidays to you and everyone!